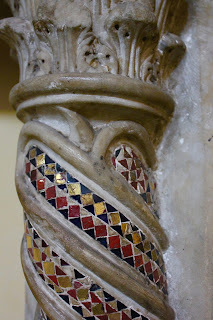 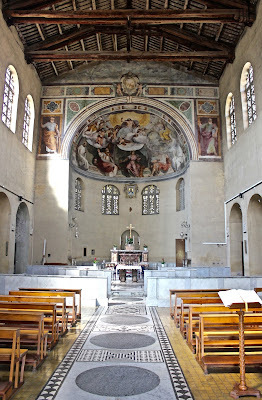 The Roman Anglican: An alternative walk: the "Little Aventine" and its ancient churches. 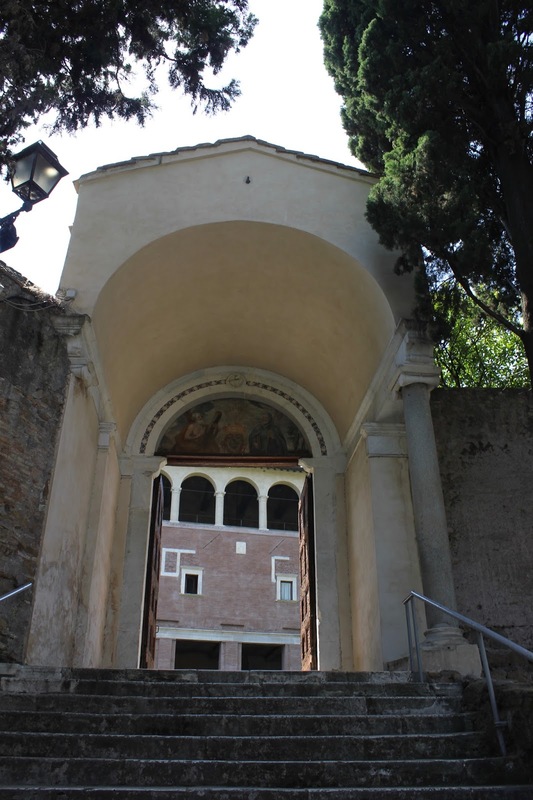 An alternative walk: the "Little Aventine" and its ancient churches. 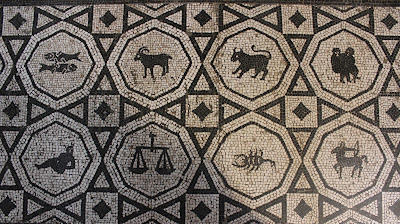 Rome is a large city and there are infinite “alternative” walks one can take around it to explore new areas and sights - recently we have had a rather pleasant day that I would refer to as “English-summer-weather”. 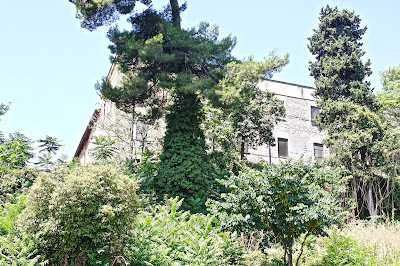 So I decided to exploit it and follow one of these tracks: on a rather cool summer morning I decided to explore the “alternative” side of the Aventine hill which we all know for the early Christian basilica of Santa Sabina and the Benedictine abbey of St. Anselm. Not, too far from that in an area known as the “Little Aventine”, near the Circus Maximus and the Testaccio and Piramide neighbourhoods, we find this rather residential area, indeed, truly pleasure to explore, away from the bustling centre of town. 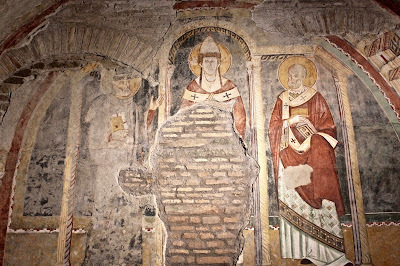 Here we can find two ancient churches: Santa Balbina and San Saba. 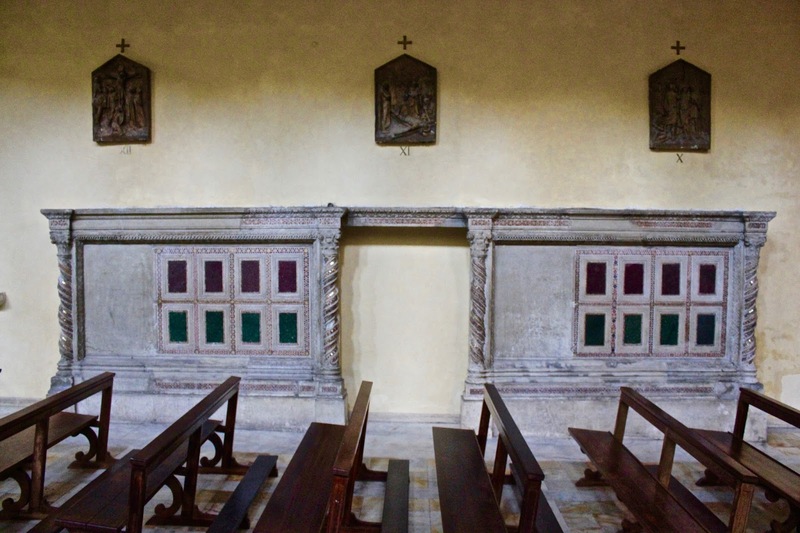 Two basilicas. 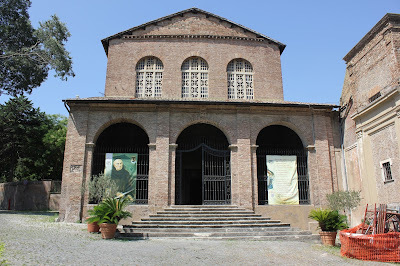 The first one, Santa Balbina, is an ancient church which is sadly always closed and so I had to ring the nearby nuns to be granted access. 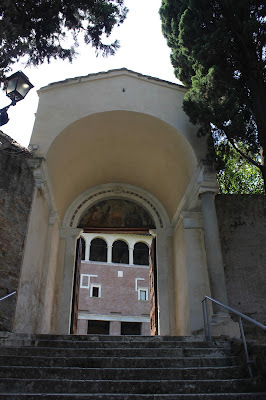 Getting to the basilica is a fair experience in itself, one goes up on a little hill through a Medieval narrow alley, filled with all sorts of spring flowers with the loveliest of smells, at the end of it is the basilica, located on an ancient, elevated piazza towering over Roman pine trees and ancient ruins, on one side of the basilica is the Medieval fortified monastery. 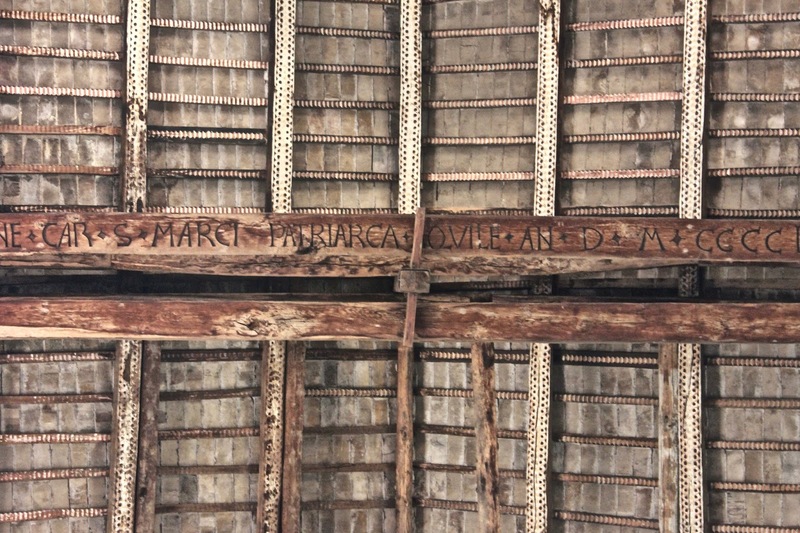 The façade of the church was restored in the 16th century but reflects the original early Christian asset. 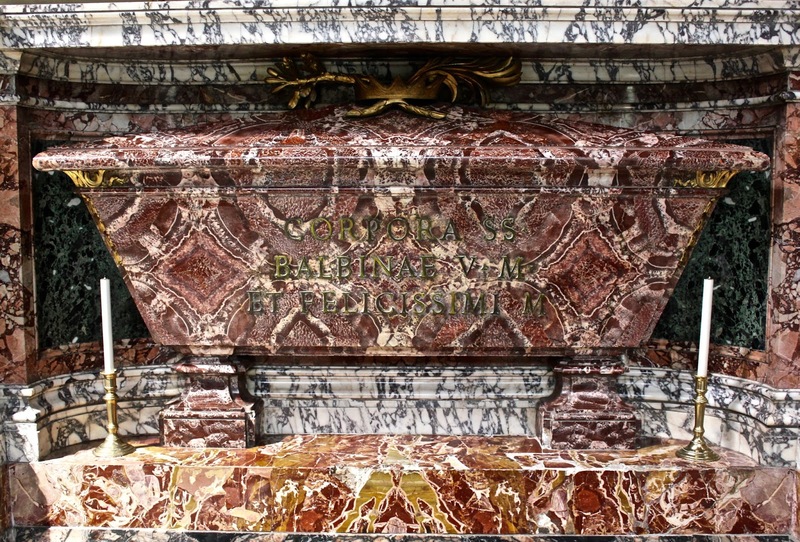 The church is dedicated to the early Roman martyr Balbina of the 2nd century but it was given a titulus in 595. 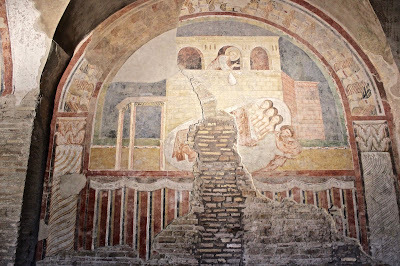 It was built on the house of a Roman consul and a Mutatorium Caesaris, a sort of retirement house. 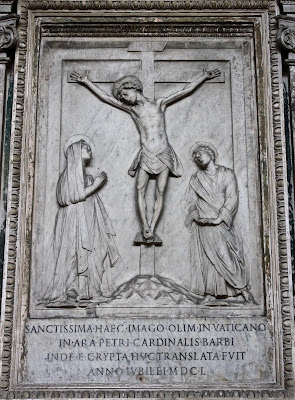 It has been restored several times through the centuries, the first time was under Leo III, then cardinal Marco Barbo, nephew of Paul II in 1499. 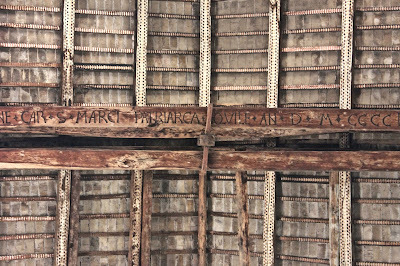 His name can still be seen on the ceiling. The narthex hosts some interesting features such as the fresco of Innocent VIII’s coat of arms. 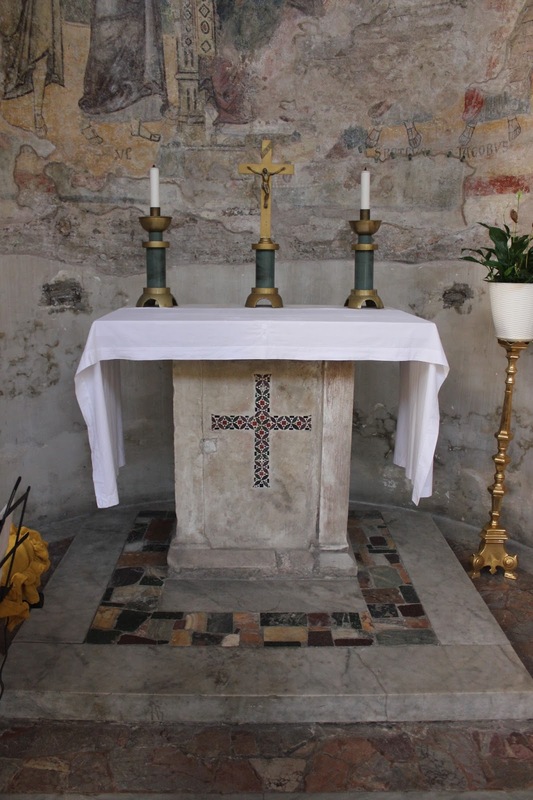 The church was abandoned during the 17th century and much of the interior was vandalised but it was once again opened in 1698. 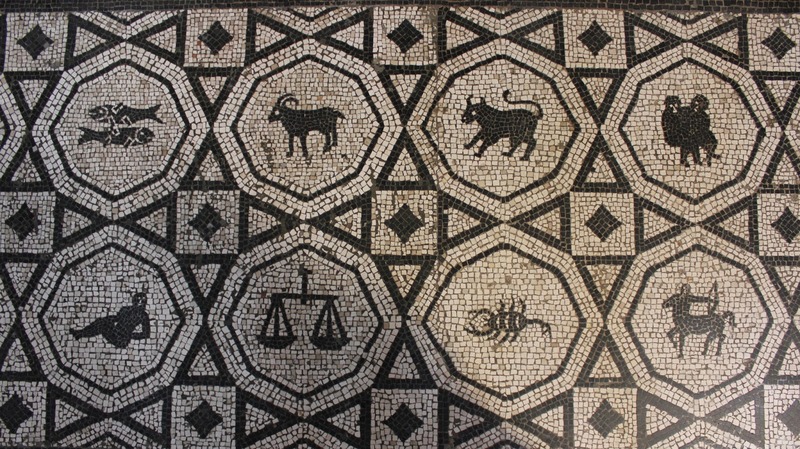 In 1929 it went under an extensive renewal: the Schola Cantorum was rebuilt, but in a minimalistic Fascist-style key, an interesting feature is the floor of the basilica which was re-decorated with mosaics from the houses found in the newly excavated Roman Forum. The church has a single nave, six semi-round chapels open on the two sides, topped with windows restored to their early-Christian look. 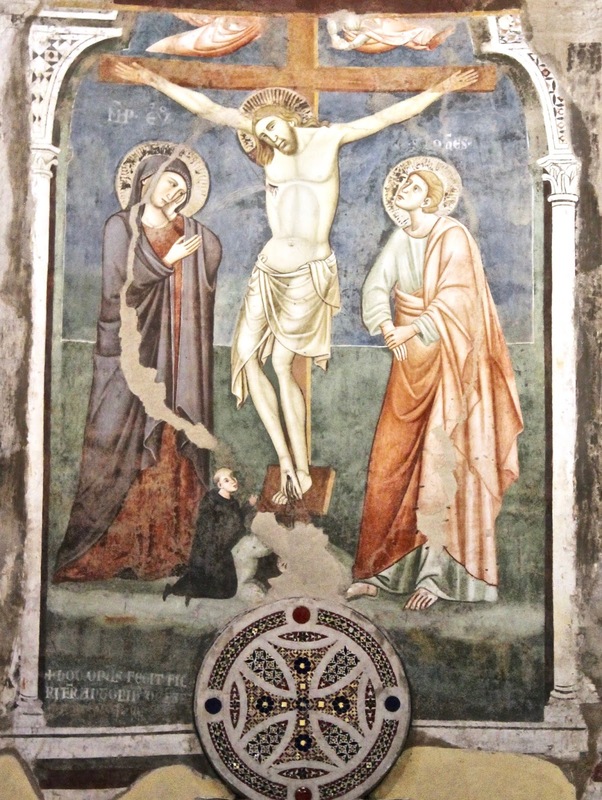 The church has several interesting treats. 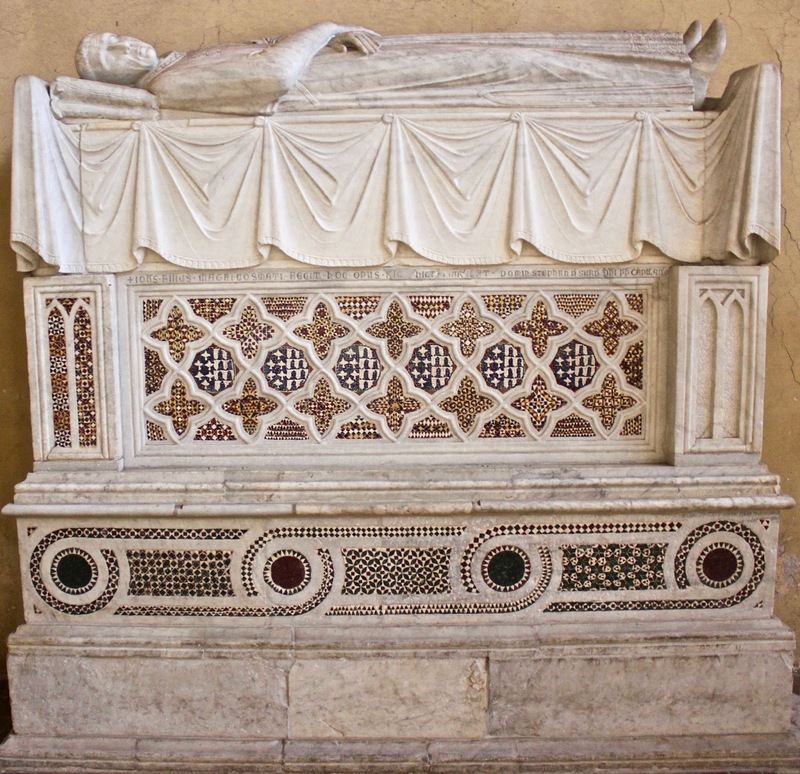 Such as the early 14th century monument to Bishop Stefano de Surdis with fine Cosmatesque decorations, originally from old St. Peter’s. In a chapel is the Renaissance-style Crucifixion by Florentine Sculptor Mino da Fiesole, made for the tomb of Paul II in Old St. Peter’s. 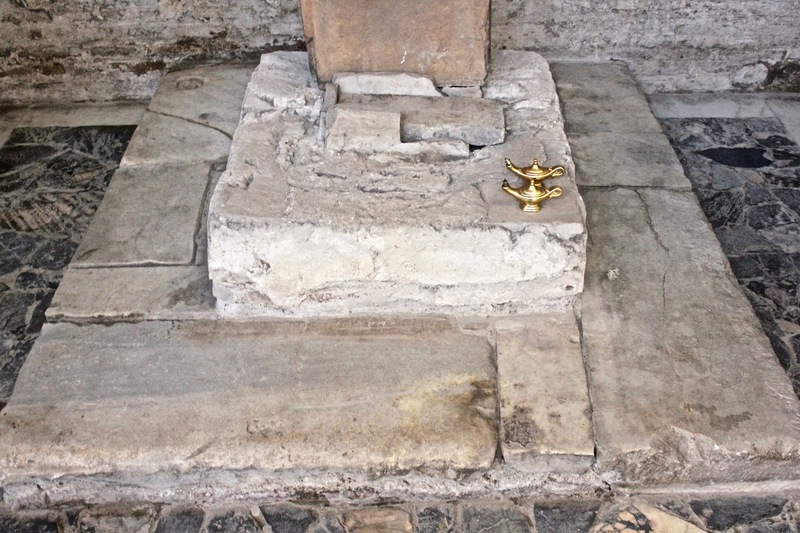 Some early Medieval altars are interestingly still used. 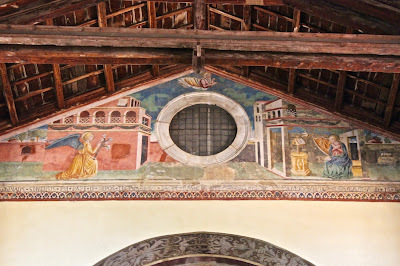 A very interesting feature are also the Medieval frescoes found in the side chapels, by the school of the “Roman Giotto”: Pietro Cavallini, famous for the mosaics in Santa Maria in Trastevere. 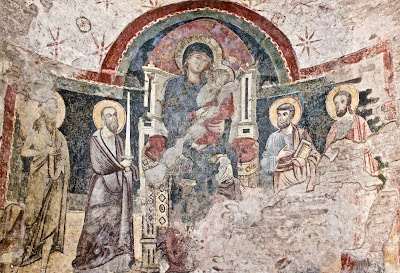 They include fine representations of Madonna and Child with Saints, Christ and Saints. 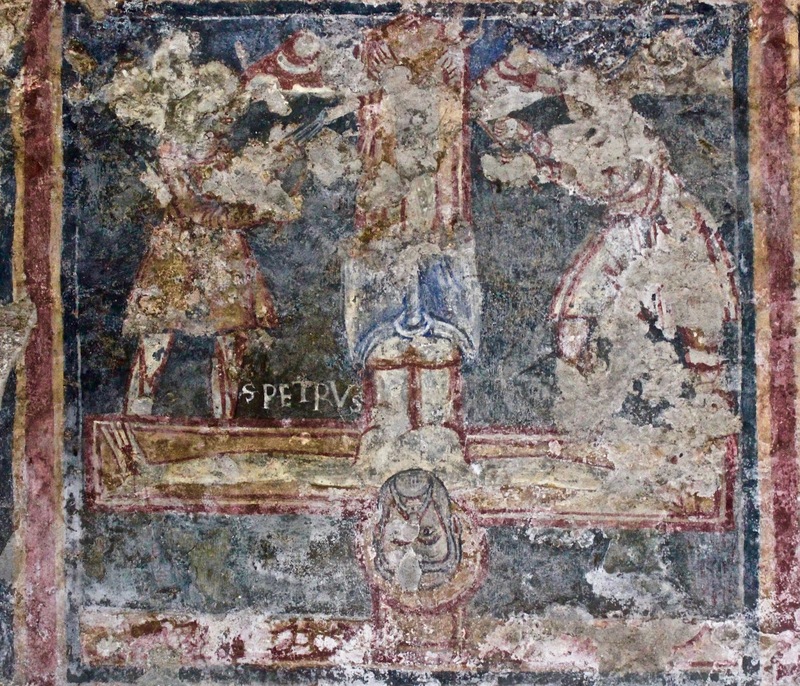 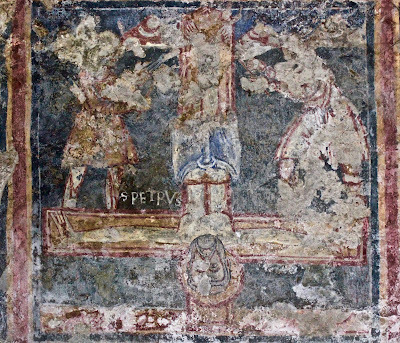 In the counter-façade there are fragments of a crucifixion. 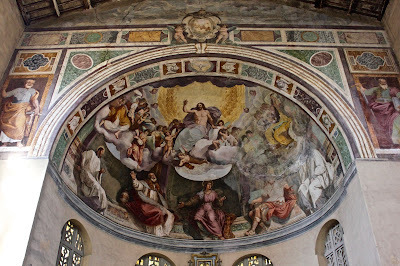 The apse was decorated with mosaics that had fallen in the 12th century and was restored with frescoes by Anastasio Fontebuoni (1599) representing Christ the redeemer in glory with Saints (including Balbina). 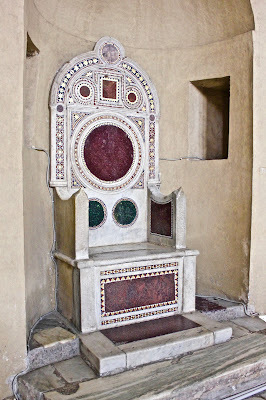 In the apse is also a very fine cosmatesque cathedra (13th century). 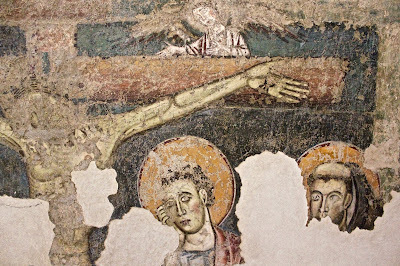 One last interesting detail is the last chapel on the left-hand side which hosts some fragments of Byzantine frescoes, such as the Crucifixion of St. Peter and the base of an early Christian altar with a hole for the relics of martyrs. 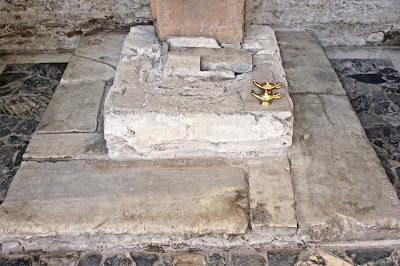 In the early Church the practice of building altars on the body of martyrs or with their relics inside started and it is interesting to see one of the very first examples of this: the base of an altar with a hole that contained such relics. 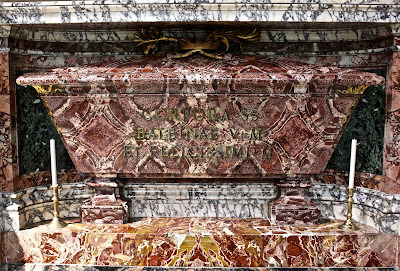 Saint Balbina is buried under the Baroque high altar. Very close to Santa Balbina is the larger Basilica of San Saba, set in a lovely residential area. 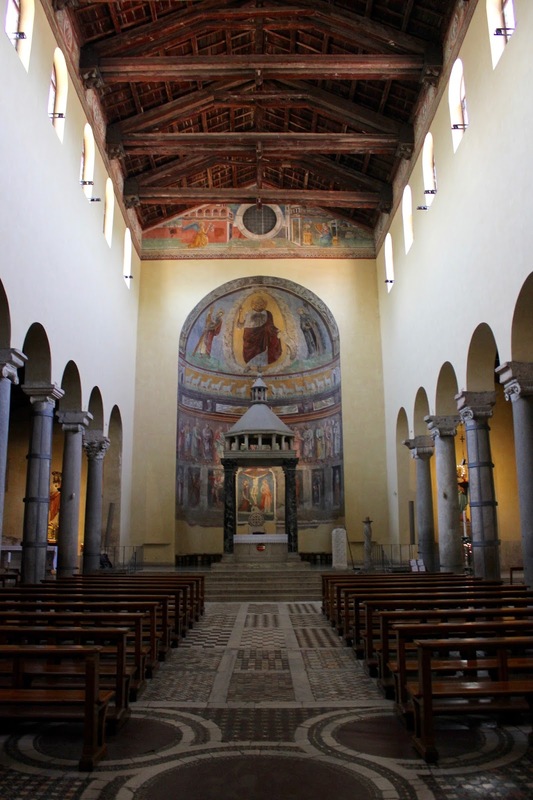 It all started with a legend: Saint Silvia, mother of Pope Gregory I had an estate on this site, when she died the estate was transformed into a monastery, affiliate to that of Pope Gregory on the Celio. The legend continues into history in that in 645 fugitive monks from the monastery of St. Sabas in Syria Palestina, who had fled because of the Islamic invasion, came to Rome to attend the Lateran Council. 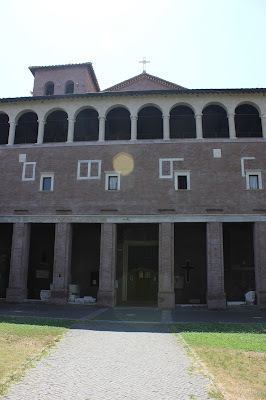 These monks settled in an old domus on the “Little Aventine” and founded an eremitic cell. 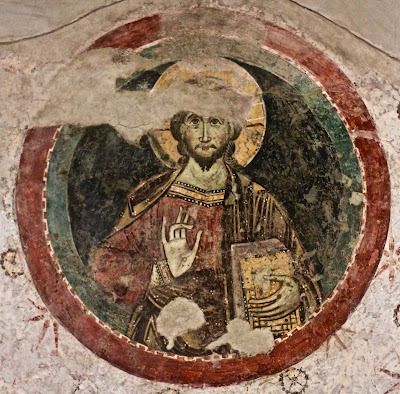 They started the cult of St. Sabas and the monastery prospered quickly and for a long time, it was essential since about 680 to establish strong relations between Rome and Byzantium, and its abbots (among them Saint Maximus the Confessor) held important diplomatic roles at the councils in Constantinople, in 768 antipope Constantine II was held prisoner here before being killed by the Lombards. 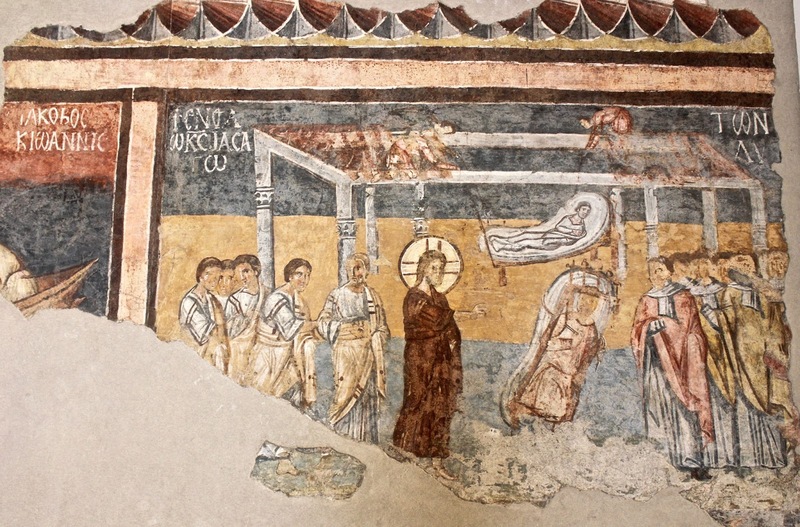 In the 8th and 9th centuries it was among the most prestigious “Greek” monasteries in Rome and received large papal donations. 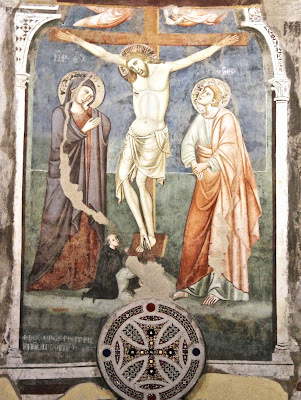 By then the church was enlarged and became “Latin”: the Benedictine monks of Monte Cassino received it in the 10th century. 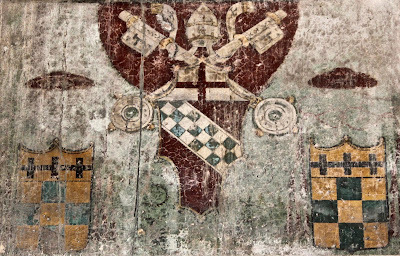 Anselm, nephew of Saint Anselm, was one of the abbots before departing to England as a papal legate. 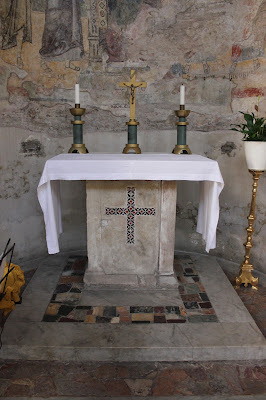 The church then passed on to the Cluniac order in 1144 as the area was perfect for ascetic life. In 1503 for the same reason it passed on to the Cistercians and in 1573 it was finally conveyed to the Jesuits. 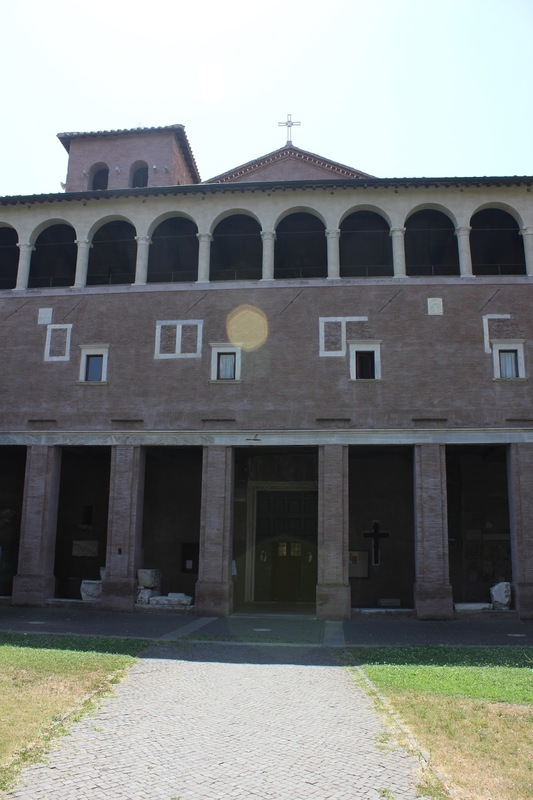 The church can be accessed through a small 13th century porch that leads us into a charming courtyard onto which the façade of the basilica is located - it is essentially the original loggia topped with a Renaissance loggia. The interior is quite interesting: there are three main naves: the central one ends with a round apse decorated with 16th century frescoes and a 14th century crucifixion, the altar is under a Medieval ciborium, under the altar are the relics of Saint Sabas. 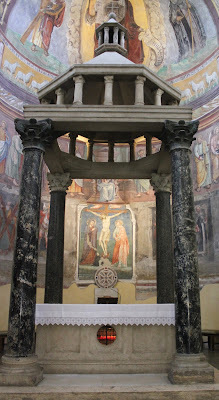 The columns in the nave are from ancient classical buildings - a popular Medieval technique known as “spoglio”. 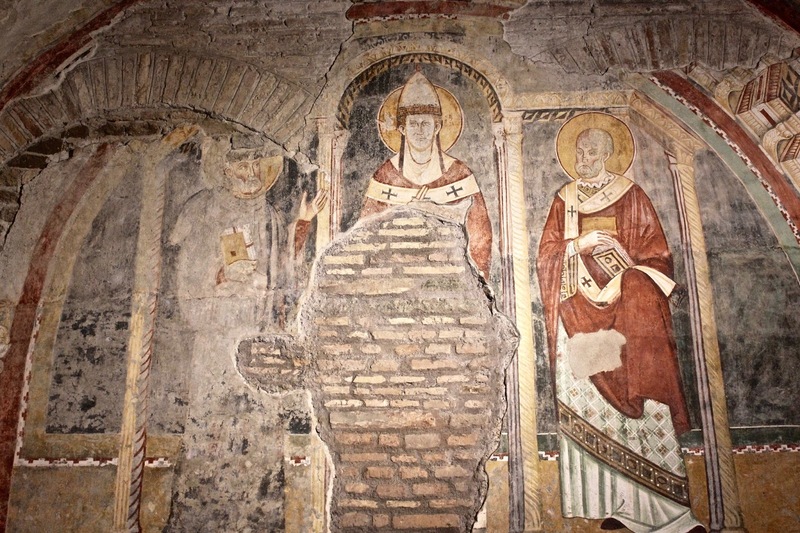 Interesting features include the notable “fourth nave” - on the left hand side of the church: the remains of an ancient chapel which is decorated with 13th century frescoes representing the miracles of Saint Nicholas: St. Gregory in a throne with two saints, a Madonna and Child and St. Nicholas donating alms to three poor women who couldn’t marry. The parish hall contains frescoes from the 8th and 9th century, the Greek monastery: a very fine one is that of Jesus healing the paralytic, the fresco, interestingly, shortly precedes the eastern Iconoclast crisis. 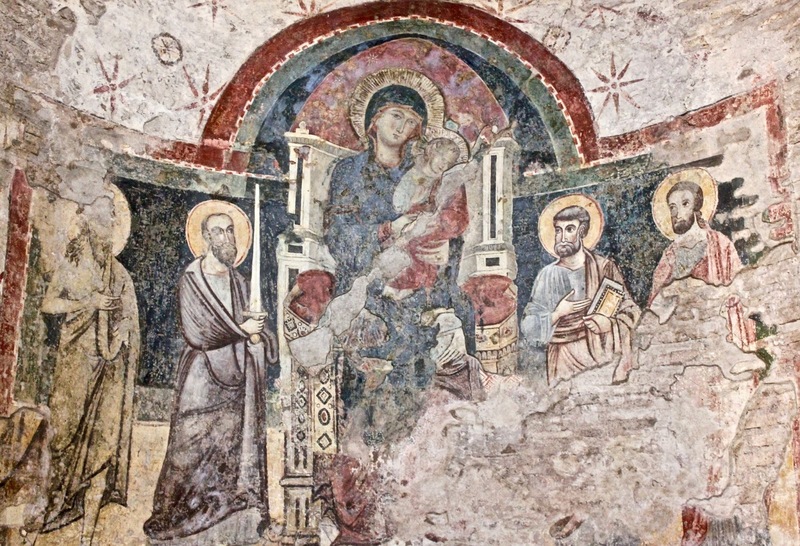 In the parish hall is also an interesting Madonna with Child and Angels, probably a late 13th or early 14th century fresco. 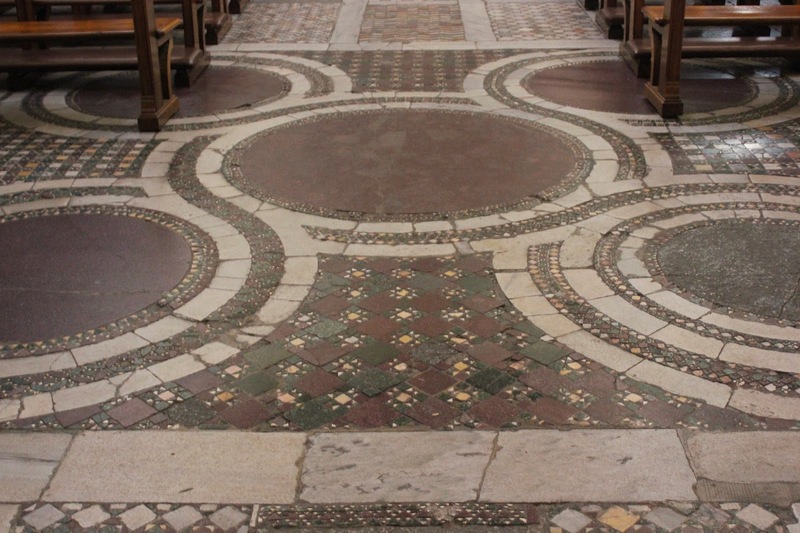 Another interesting feature of the church is the Cosmatesque work from the 13th century: in the floor and on what remains of the Schola Cantorum, now in the right hand aisle. In the late 15th century cardinal Piccolomini supervised the restoration of the church and commissioned a fine Renaissance fresco representing the Annunciation above the apse. 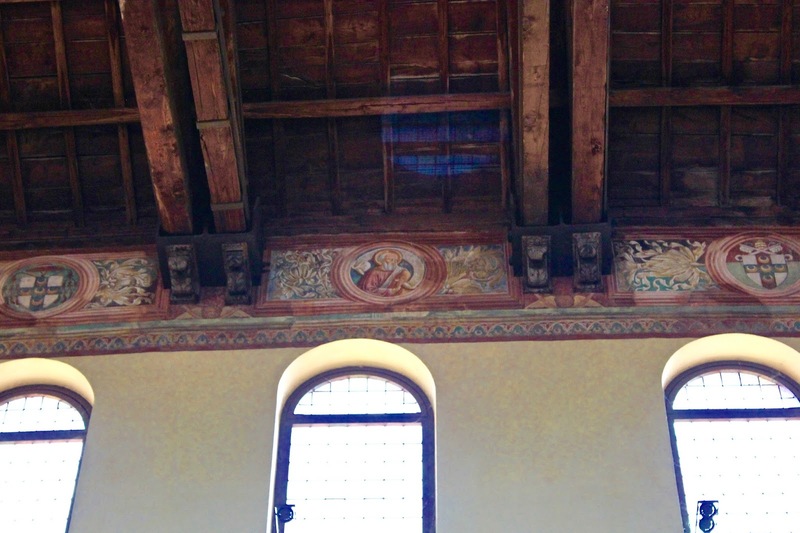 The walls along the border of the ceiling were also decorated with frescoes with the Piccolomini coat of arms. 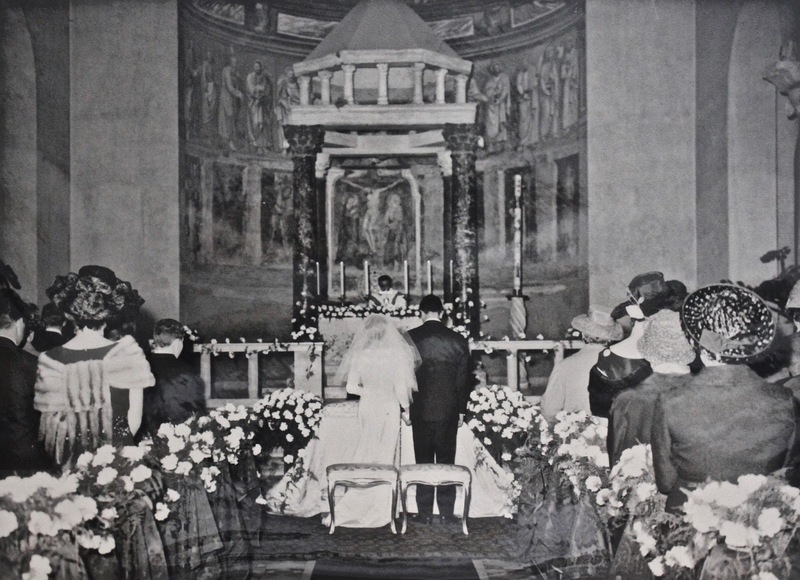 The church, because of its fascinating location and large garden has always been a good spot for weddings, it is here that my grandmother married my grandfather in the late 1950s, the service was celebrated by my uncle. 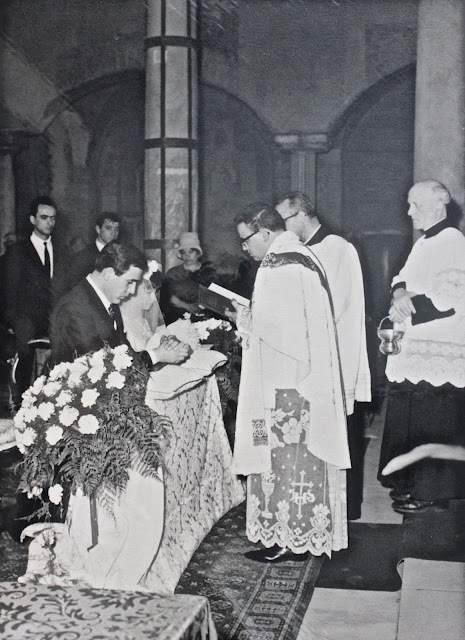 The pictures are clearly from before the liturgical reform and the late Medieval altar rail can still be seen. The lost frescoes of Santissimi Apostoli. Abide with me; fast falls the eventide: Nice. 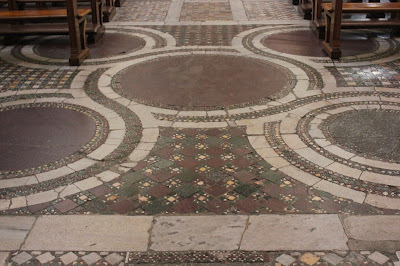 Praying for the terrorist attacks in France. 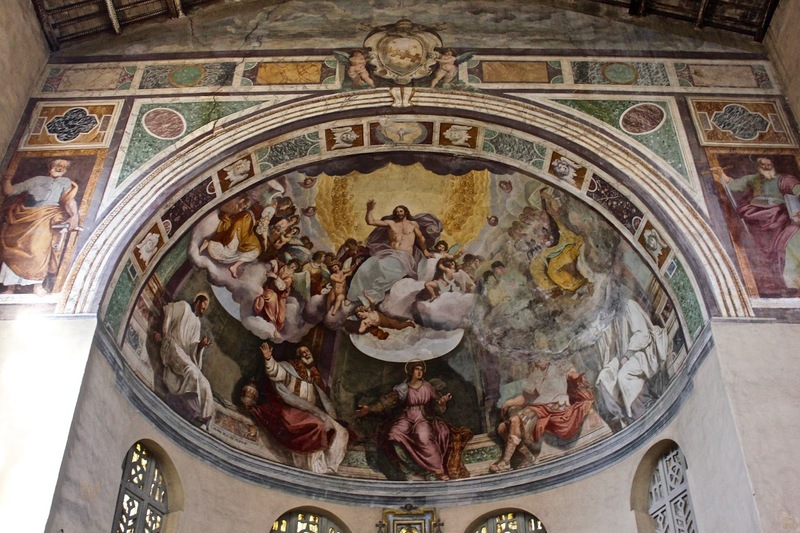 The secret of the Sant'Angelo bridge. 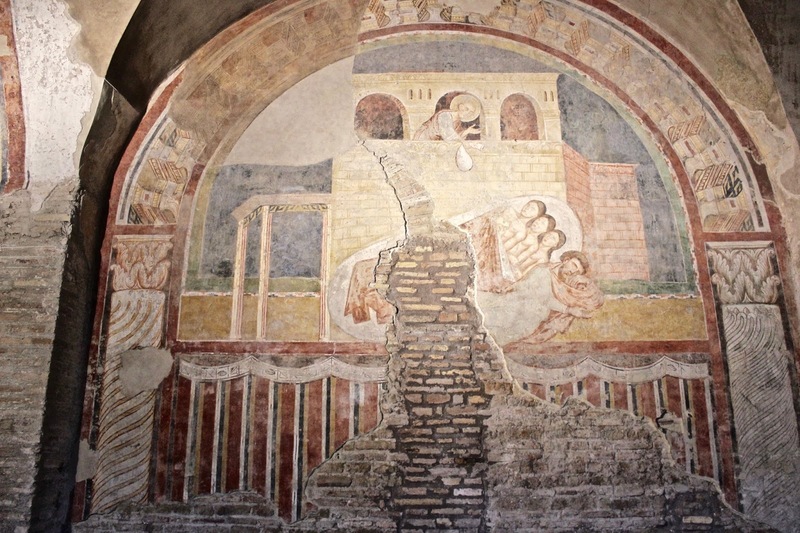 A fresco that tells a story. 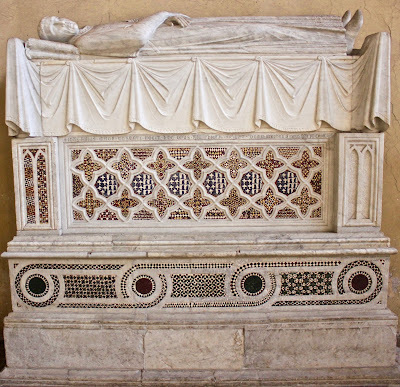 A Medieval Englishman's tomb in Rome.